Left to right: Special miracle service in Orange where God healed, filled, and empowered many people, including the young girls (12-14 years old) in the middle who were powerfully filled with the Holy Spirit. We had an awesome outpouring of the Spirit with a visitation of miracles in different services where we ministered over the last couple of weeks as well as seeing five people come to the Lord. Many told us they had never been touched by God in such a way before as the Holy Spirit moved in power; many were renewed and empowered and baptized in the Holy Spirit. 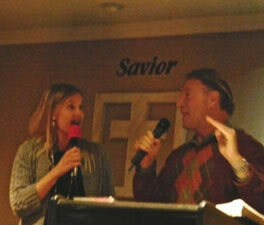 A woman who was needing a hernia operation received prayer. When she went to see the doctor on Monday, he could not find her hernia. After extensive tests the doctor was baffled as the hernia had completely disappeared! Glory to God! A man who had been looking for work for months with no success, got a job the following Monday after the service. One woman who had back pain felt the pain immediately leave her as she got prayed for. Another woman who was so sick during the service she couldn’t even stand up, felt the sickness completely leave her and all her strength return, feeling fully healthy again after we prayed for her. One of the services was being broadcast live on the Internet. As Bryan gave a word of knowledge regarding someone with an earache a boy watching reported that he was healed immediately from a terrible pain in his ear. There was also someone who was suffering pain from an illness and as we prayed for her she was released from her pain as well as receiving the gift of tongues after seeking the gift for years, even though we weren't praying specifically for her to receive tongues. Hallelujah! Acts 14:3 declares: "...the Lord confirmed the message of his grace by enabling them to do miraculous signs and wonders." It is important to notice that it was the message of grace that God confirmed with signs and wonders. It is essential that we understand the central place of grace in the work on the cross. Jesus took on all our sins on the cross and paid the price for us once for all. He has fulfilled the law and given us His very own righteousness through faith in Him and the work He did for us. He has also given us the Holy Spirit who not only gives us joy and power but fills us and heals us as well. Glory and Hallelujah! 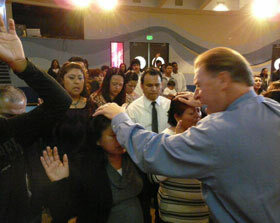 Left: Ministering down in National City in San Diego where we had a very powerful move of God. 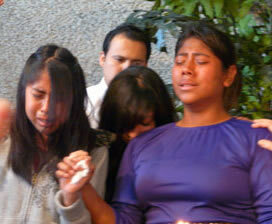 Middle: Two young people giving their lives to Jesus. 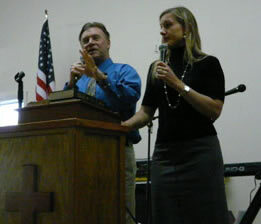 Right: Preaching in San Bernardino during a special New Years' service.